So, once again this year I’m writing a column in tribute to a beloved member of our family who has died. I’m ready for a new year. 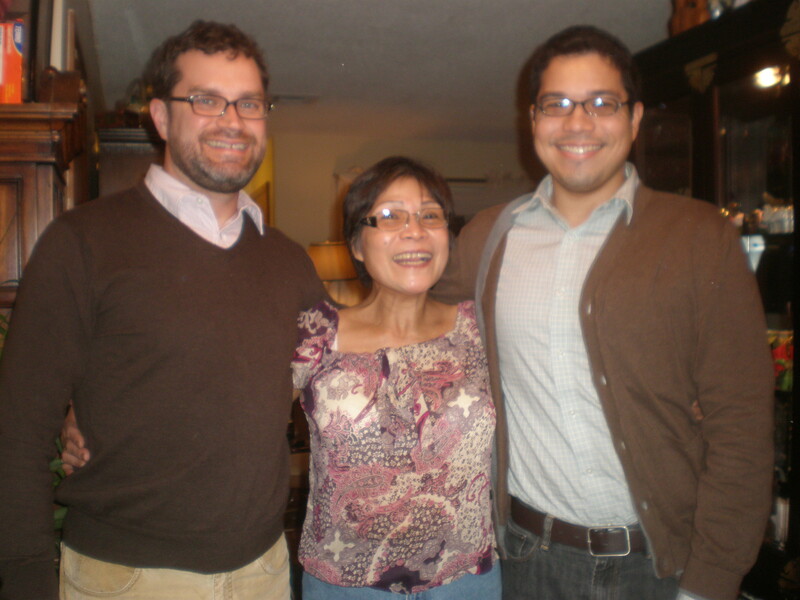 My mother-in-law, Ninfa Murabe Cich was, simply put, the most hard-working and generous person I’ve known. Most of you experienced her character traits yourselves last year at Sebastian’s baptism where she cooked Filipino food for 200 people. For many years Ninfa worked three jobs. During the day she worked full-time in a meat processing plant. After an eight-hour shift of that difficult work which would exhaust most people, she then went to her evening job as a cook at the bowling alley on Tinker Air Force Base. Two full-time jobs she worked every day. Then she’d take her vacation days to work a seasonal job around Christmas and St. Valentine’s Day as a See’s Candies salesperson. One year she was the top sales person in the nation, beating out all the year-round employees. On her days off she volunteered at a soup kitchen and would visit people in nursing homes. On top of all this she ran the family business in the Philippines. I forgot to mention that she did all of this as a cancer survivor. Her energy was unbound. Once when she visited us, we went to bed exhausted every night while she was still up and ready to go. She was disappointed when we couldn’t find a place to go dancing on a Tuesday night. Why did she work so many jobs? She viewed it as her responsibility to provide for her family in the Philippines, who are devastated by the news of her death. She was the matriarch who made decisions and solved problems. She also put through college every niece and nephew who wanted it and would promise to give some of their future income back to the family. Every few years we packed crates of clothes and gifts, usually purchased at thrifts shops, which she would take back home and distribute to the vast family she helped support. I admired her deeply and am angry that Sebastian will not grow up with his Lola. I am thankful for the time they did have, the wonderful pictures we can show him, and the many stories we will share. I want him to inherit her perseverance, her strength, her devotion, and her generosity.